We met in a large city in the Middle East with a group of leaders. The focus was going through the Gospel of Mark. Each person in the group had previously received a workbook, printed in Arabic, in order to work through the lessons. Our goal was now to go through the material with them, ask questions, and promote discussion. We wanted to ensure that they truly understood the text and the principles contained in the passages. These students are the current and future leaders of the church. Christians are a small minority in this region dominated by Islam, but God is growing His church, and many are coming to know Jesus as the Christ. But these leaders need to be trained. 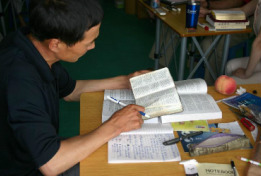 They desire to learn the Scriptures but do not have access to a Christian seminary. BEE World provides them the education and training so that they can teach God's Word to others. The Middle East is the birthplace of Islam, a religion embraced by 23% of the world. In most Arab countries of the Middle East, the Muslim population is well over 90% while evangelicals are usually less than 1%. Despite terrorist activity and fighting in many regions, the gospel is going out in the Middle East through the Internet, satellite, Bible distribution, and sometimes unique ways of the Lord. The desperate need is for proper training of new believers and equipping of leaders to strengthen the emerging church in the face of fierce persecution. 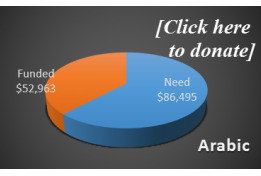 We have made good strides in translating our courses into Arabic, but still have 10 courses to complete. We also have significant work to get all of the courses on to our internet site, Internet Biblical Seminary, so that more Arab brothers and sisters will have access to this teaching. We currently serve in three countries where scores of Arab men and women receive training. We are establishing a new training center in one strategic Arab country with our first full-time Arab staff member, and are implementing the Internet Biblical Seminary in Arabic. In the near future, we will work to expand the new training center and extend our range of ministry from this hub. Another goal will be to increase the number of Arab staff members working with us in the Middle East, brothers who can speak Arabic and who are in tune with the culture.